the heart sculptures must be submitted by Wednesday, August 1, 2018. ‘Hearts in San Francisco’ is one of the most widely recognized public art projects in the country. mixed media sculptures, Swarovski crystals and more. 400 pounds), table top heart (16" tall x 17" wide x 8" deep; 25 pounds), or mini heart (7" tall x 6"
Francisco's Union Square from February 2019 through to October 2019.
more than one design entry. Materials may be submitted online, via US mail, email or in-person. notifications will be sent via email the week of August 20, 2018. San Francisco General Hospital Foundation is now accepting submissions for the annual ‘Hearts in SanFrancisco’ public art project, which will be celebrating its 15th anniversary. For the 2019 series, the Foundation welcomes design submissions by both up-and-coming and established local San Francisco Bay Area artists. 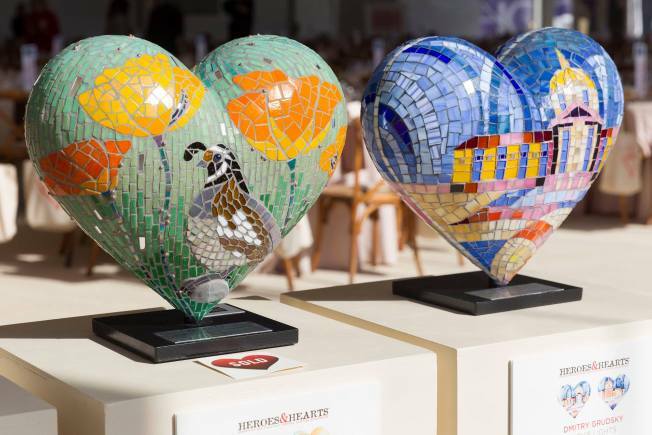 The 2019 ‘Hearts in San Francisco’ series will include eight large hearts, six table top hearts, and 18 mosaic mini heart sculptures. Design renderings for the heart sculptures must be submitted by Wednesday, August 1, 2018.
and children’s health, chronic disease management, palliative care, HIV/AIDS, orthopedics, trauma and more. ‘Hearts in San Francisco’ is one of the most widely recognized public art projects in the country. Since the project’s inception in 2004, San Francisco Bay Area artists have created more than 350 Hearts that have gone on display all across the city of San Francisco and beyond, from Union Square to the lobbies or conference rooms of corporate supporters throughout the state, including Genentech and Wells Fargo. Each Heart is a unique, one-of-a-kind work of art and celebrates the diversity of San Francisco through designs made of acrylic paints, mosaic art, mixed media sculptures, Swarovski crystals and more. Artists have the option to propose a design for either a large heart (5' tall x 6’ wide x 40" deep;400 pounds), table top heart (16" tall x 17" wide x 8" deep; 25 pounds), or mini heart (7" tall x 6"wide x 2" deep; 5 pounds). Select Large Hearts will have the opportunity to be displayed in San Francisco's Union Square from February 2019 through to October 2019. Artists interested in applying must complete an application and submit with a full-color designrendering (8.5" x 11" or larger) on or before Wednesday, August 1, 2018. Artists may submit more than one design entry. Materials may be submitted online, via US mail, email or in-person. Entrants must provide their own workspace and meet the artwork completion deadline ofWednesday, October 31, 2018. Artwork guidelines, official regulations, and artist applications are available here. Heart sculpture artist selection is conducted by a committee comprised of San Francisco General Hospital Foundation staff, board members and community volunteers. Selectionnotifications will be sent via email the week of August 20, 2018.